Delay systems (called also hereditary or with memory, deviating arguments, aftereffects, post actions, dead-time, or time-lag) represent a class of infinite-dimensional systems  largely used to describe propagation and transport phenomena or population dynamics (reproduction, development or extinction) [320, 369]. 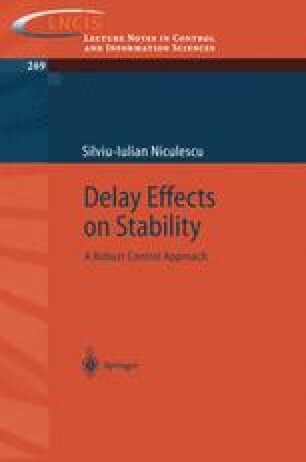 In economic systems, delays appear in a natural way since decisions and effects (investment policy, commodity markets evolution: price fluctuations, trade cycles) are separated by some (needed analysis) time interval. In communication, data transmission is always accompanied by a non-zero time interval between the initiation- and the delivery-time of a message or signal. In other cases, the presence of a delay in a system may be the result of some essential simplification of the corresponding process model.